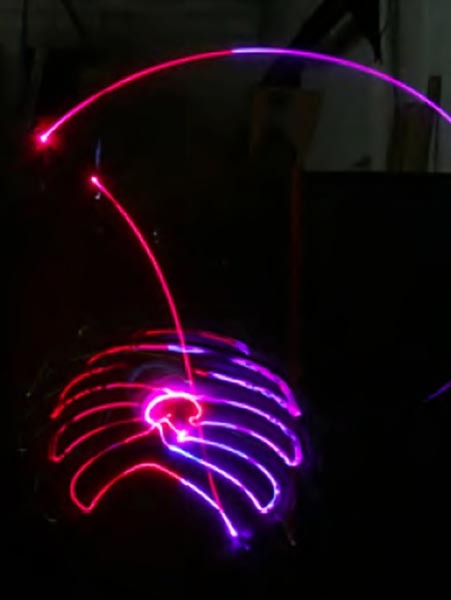 Description: This workshop will explore interactive and intuitive robot motion control as a medium to explore non deterministic design trajectories and human-robot interactions. The workshop will focus on the development of custom user interfaces, including parametric constraint models and logics. Through iterative design charrettes, students will engage with ‘live’ robotics and build in groups dynamic ideation environments where human and robot actively engage with the space. Engaging scanning technologies, human interface devices, user tracking, we are placing the robot as a mediating device in a feedback loop which engages simultaneously with the digital and physical world in the now. Building custom UI’s we will actively explore and imagine how we engage with matter and the space once we are able to move things precisely, intuitively and interactively. Duration: Tuesday 15th March – Thursday 17th March 2016, 10am-5pm. Description: This workshop aims to initiate participants in collaborative robotics workflows using various sensing devices, through a demonstrative application of assisted assembly of generative patterns from a predefined kit of parts. These parts, randomly distributed throughout a multi-robot work cell composed of small-payload industrial arms and a pool of sensors sharing the same network, will be automatically located, identified and assembled by the machines to match models and constraints specified by the participants during the design phase and at runtime. The resulting proto-architectural system, composed of a hierarchy of prefabricated interlocking components, will illustrate the possible architectural relationship between standard and non-standard elements within a single assembly. The properties of each part, considered as a combination of features shared by a single entity, will be described and detected via geometrical (point cloud), physical (mass), and contextual (denomination) means. Duration: Tuesday 15th March – Thursday 17th March 2016 10am-5pm. Software: HAL Robots Programming & Control, Rhino + Grasshopper. Previous knowledge required: Familiarity with Rhino 5 and Grasshopper medium level required. 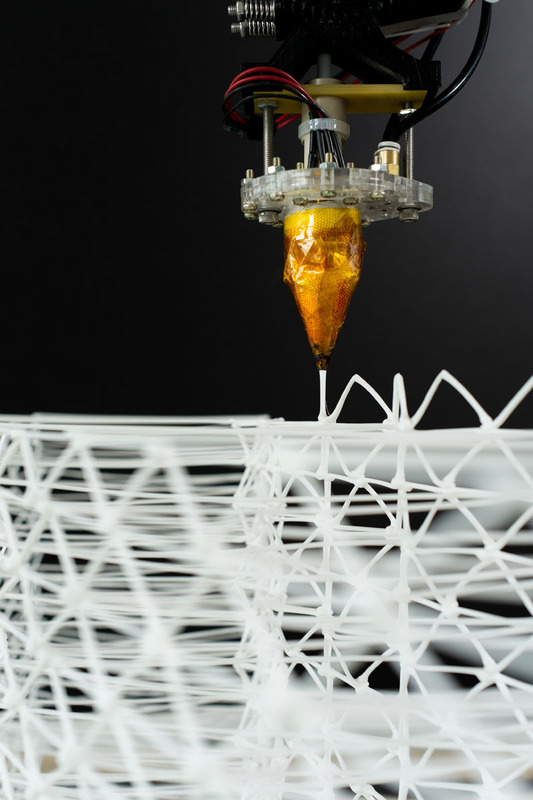 Description: This workshop will explore the relationship between robotic fabrication and generative design. 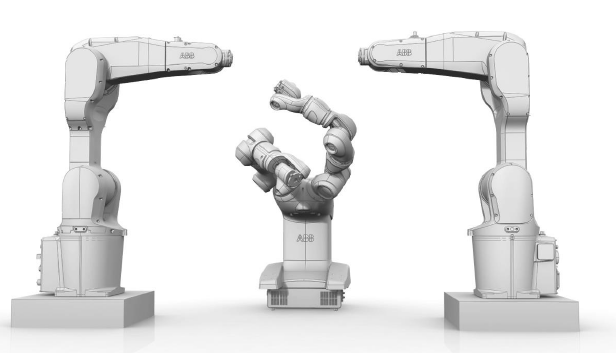 A workflow will be established that links real-time robotic control with vision systems and multi-agent generative design algorithms. This relationship describes a process of stigmergic fabrication, where robots are considered agents within the generative design process. The robots will deposit/extrude plastic through a series of semi-autonomous rules or behaviors in response to previously extruded polymer. This sets up a self-organising feedback loop where the robot/agent affects its environment through deposition of plastic material and the plastic affects the subsequent motion and behaviors of the robots through vision systems. 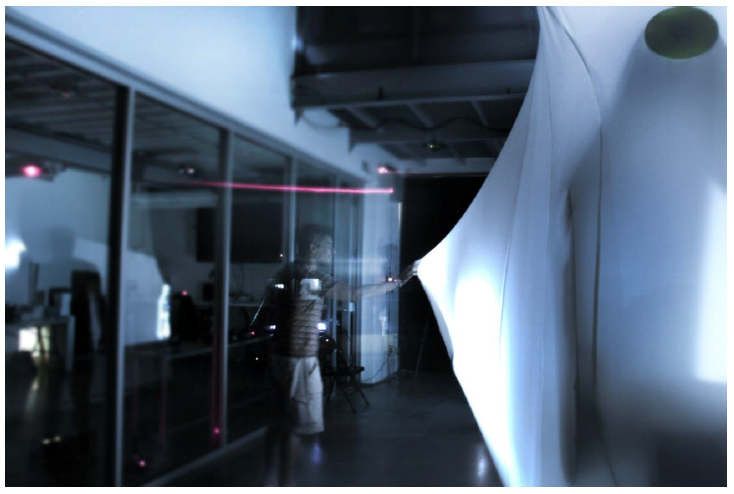 This emergent process compresses design and fabrication into a single unified operation. Previous knowledge required: Some experience with Grasshopper and/or Processing is preferable. 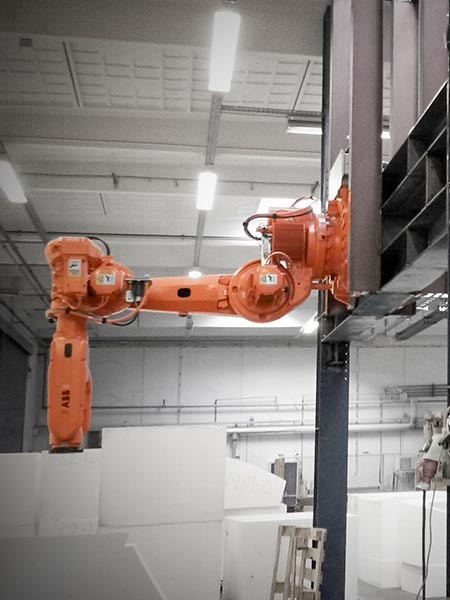 Experience with KUKA PRC preferable but not required. Description: Robotic fabrication processes enable designers and architects to explore the boundaries between digital and material worlds. 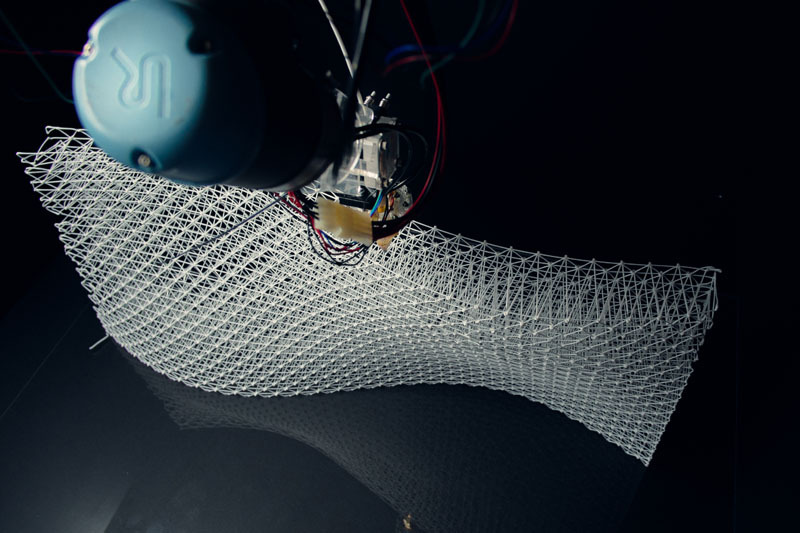 Beyond optimization criteria or parametric design, new design strategies such as generative design and collaborative design are enabling new ways of approaching material exploration through robotics. Typically, the outcomes of a fabrication process are predetermined, however, with the introduction of sensors, design and fabrication process may be interrupted by real-time feedback. 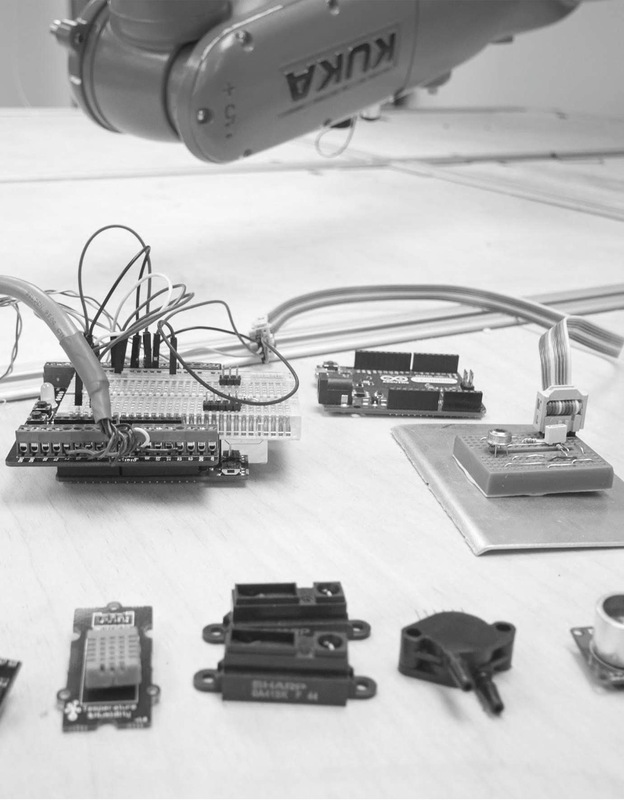 This workshop explores the potential for creative practitioners to adopt robotic fabrication processes augmented with the introduction of sensors. Using an inexpensive toolbox of sensors useful for digital fabrication, participants in the workshop will construct and integrate sensing apparatus into a 3D printing process to explore the role of material feedback in an on-going design process. Participants to bring: Own laptops, preferably with the latest stable version of Rhino, Grasshopper, Processing and Arduino installed. Extra software will be provided by the workshop presenters. Description: Recent developments in computational design and computer-controlled fabrication have significantly expanded the range of applications for timber in architecture. Although modern timber fabrication technology allows the material to be shaped into a variety of shapes, products and dimensions, the inherent material characteristics of timber are mostly neglected or even suppressed in the design and fabrication process. Yet, timber exhibits excellent mechanical behaviour and high potentials for textile and multi-material connections outside the scope of conventional timber connections. 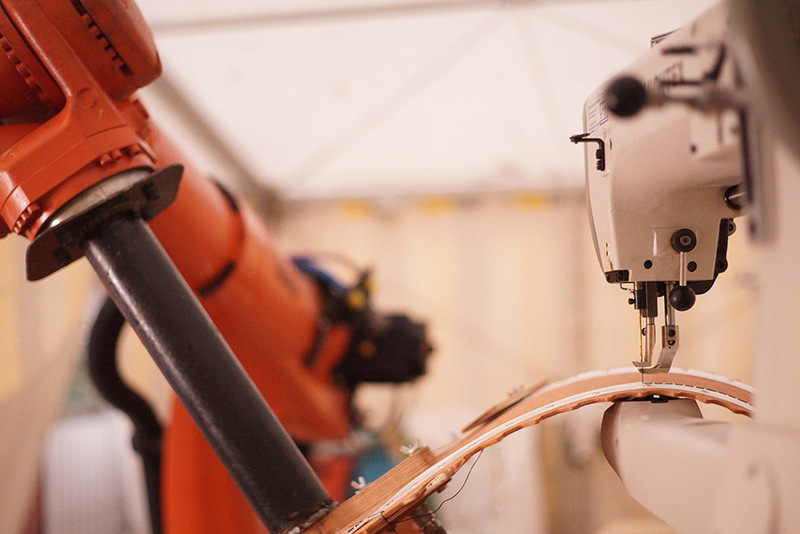 This workshop explores an alternative approach and will investigate the architectural potentials of robotic sewing of bespoke timber veneer laminates in combination with elastic bending. 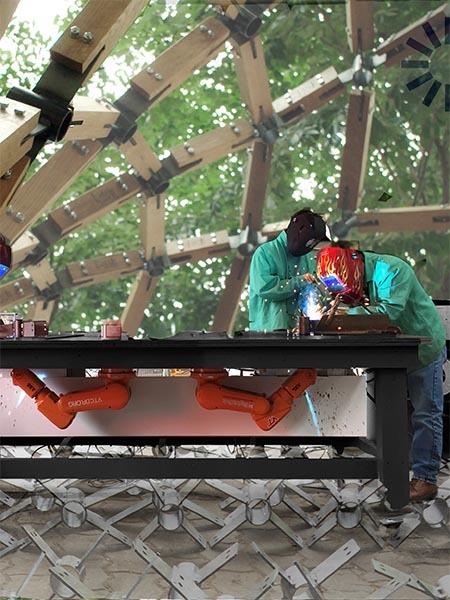 Strips of timber veneer will be laminated to achieve defined bending behaviours, and will be sewn together using a robotic sewing effector resulting in stiff, but ultra-lightweight building modules. 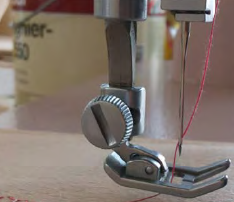 The fabrication process will be enabled by bespoke computational design tools and methods that the participants will engage with during the workshop. Description: This workshop invites participants to explore a novel method of doubly curved formwork production and concrete casting currently under development by 6 industrial and academic partners represented in the workshop: robotic hot-blade cutting. The method allows for cost-effective, industrial scale production of advanced, doubly curved concrete structures using a combination of new hardware and algorithmic developments to be presented at the workshop. Premiering for the first time bespoke geometry rationalization and segmentation algorithms and tools relative to the process, participants are invited to enquire on the relationship between geometry, computation and the robotic production through the design and making of prototype, doubly curved structures. Workshop Co-Chairs: Asbjørn Søndergaard, Jelle Feringa, David Brander, Kasper Steenstrup, Toke Nørbjerg and Kenn Clausen. www.odico.dk. 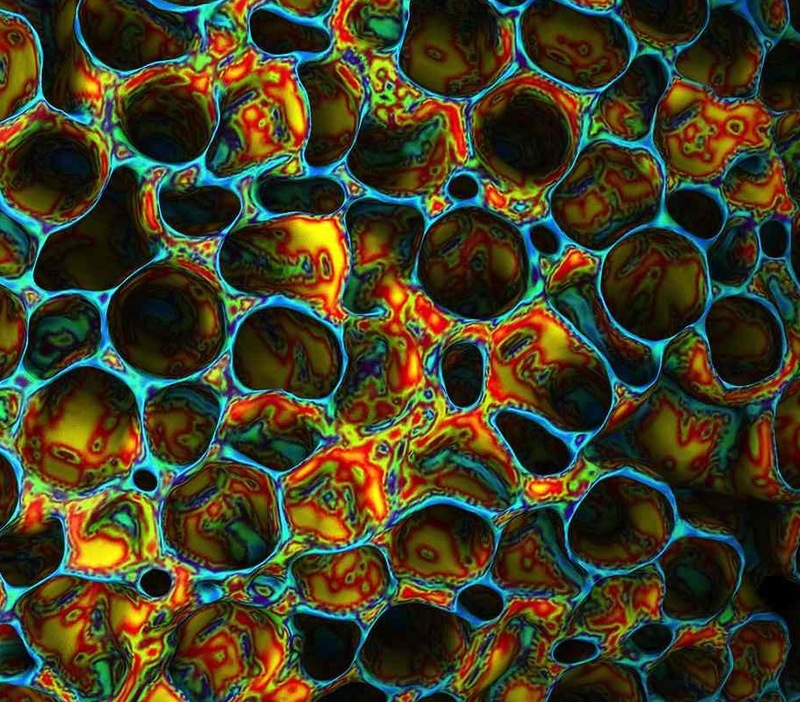 Description: This workshop will explore the generation of spatial frame structures extruded in midair. 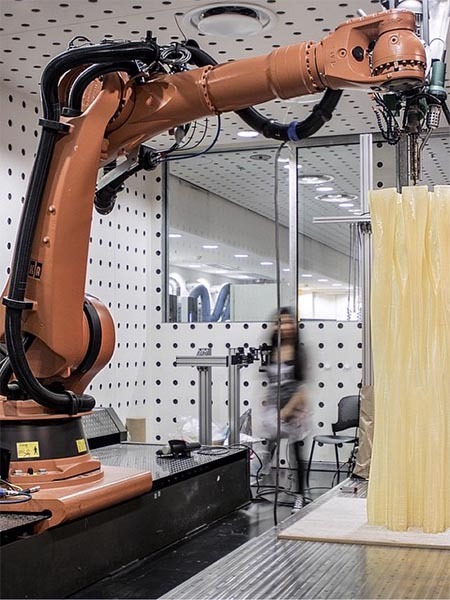 Building upon the Mesh Mould research project developed at the ETH Zurich in close collaboration with Sika Technology AG (Patent Publication No. WO/2015/034438) we will explore the constraints and opportunities that come with non-layer based 3D printing processes. 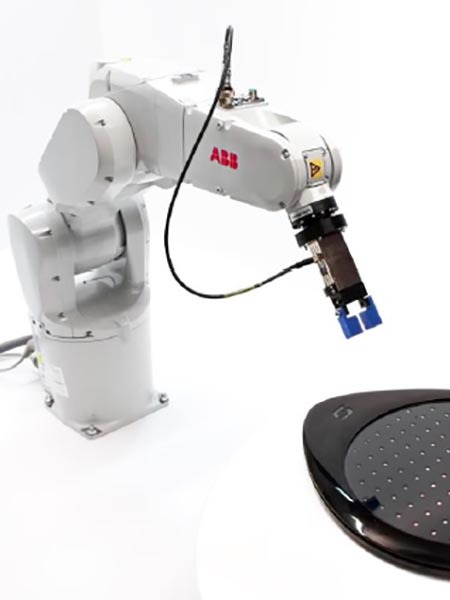 This process capitalises on the strengths of industrial robots – precision in space and time – while working strategically with their limited payload by deploying minimal material for maximal geometric definition. The workshop will demonstrate the stages from algorithmic design in rhino python via custom control software to the automated generation of instruction code and the feedback of empirical material behavior back into the generative design code. Workshop Co-Chairs: David Jenny, Wes McGee, Dave Pigram and Iain Maxwell. Participants to bring: Laptops with Rhino 5 installed and RhinoPython loaded. Required code libraries will be distributed via GitHub. Dynamo-BUILD! 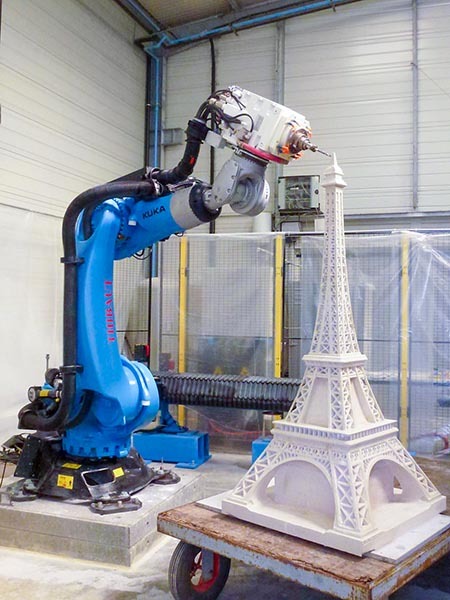 Dynamo-driven collaborative robotics for automated construction of spatial structures. 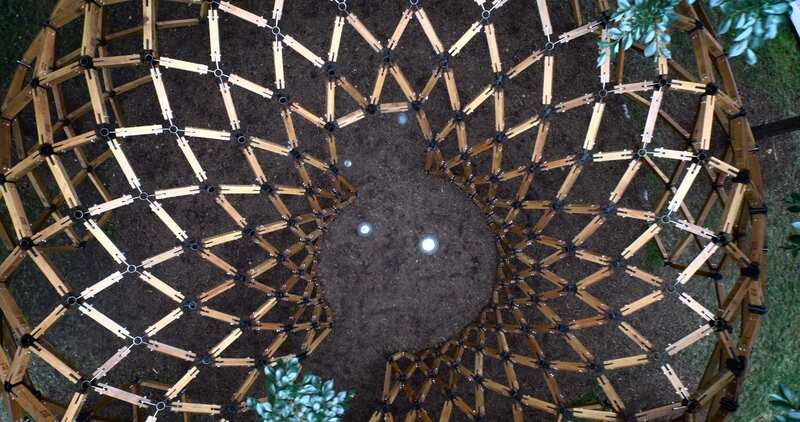 Description: Using a combination of Dynamo, Autodesk React Structures, and the new Dynamo-to-Robot workflow, this workshop will explore integrated computational design and structural optimization-to-robotic fabrication workflows to design, evaluate, and fabricate a large format prototypical spatial structure using human-machine collaboration. The Rob|Arch workshop will be the first public test of the new Dynamo-to-Robot plugin. This new plugin integrates into the advanced functionality of Dynamo to allow for the visualization of popular types of robots directly in the design environment and for simulation of possible toolpaths and movements. Previous knowledge required: General familiarity with some digital design environment is ideal but the workshop can be tailored to the expertise of the participants, programming or scripting skills not necessary. No previous Dynamo experience is needed. Participants to bring: Laptops with Windows OS, All other software will be provided. These complimentary workshops are available only with the purchase of a Conference Ticket, or Conference & Full Workshop Ticket. Order visibility available at the end of your Eventbrite registration. 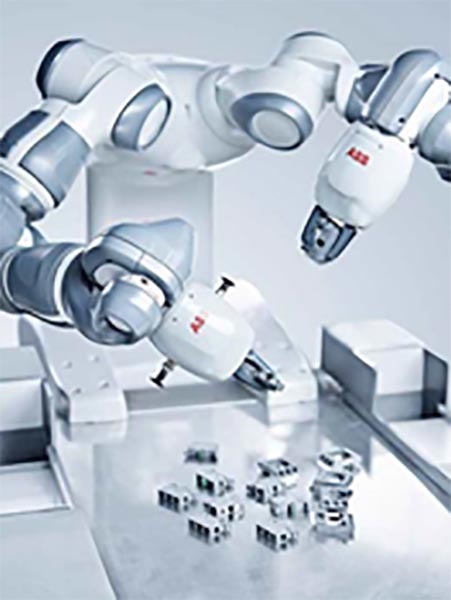 Description: In this workshop, Heinrich Munz, Lead Architect at KUKA, introduces the new mxAutomation framework that allows direct robot control from any system. 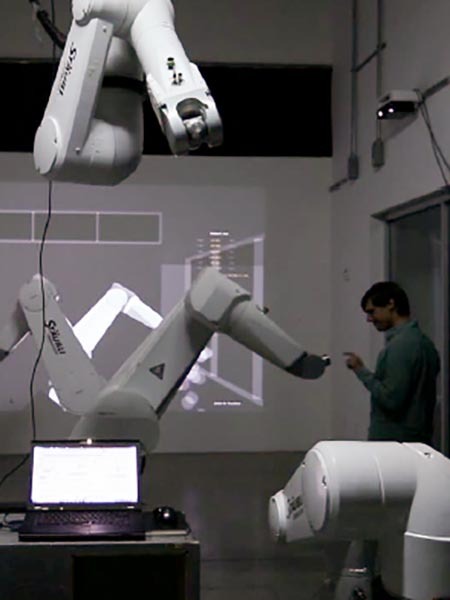 The Association for Robots in Architecture will present a new software that builds upon this new interface, allowing the user to stream data to and from the robot. Duration: 1 Day Workshop: Mon 14th March 2016 10am-5pm. Previous knowledge required: Participants should be experienced KUKA users. Description: Demonstation and discussion of collaborative robots, YuMi and Robot Studio Software, including demonstration using Occulus Rift. Duration: Mon 14th March 2016 10am-1pm. Description: This workshop will demonstrate how the some robots classified as collaborative can bring more to the design process than simply not requiring a safety fence. 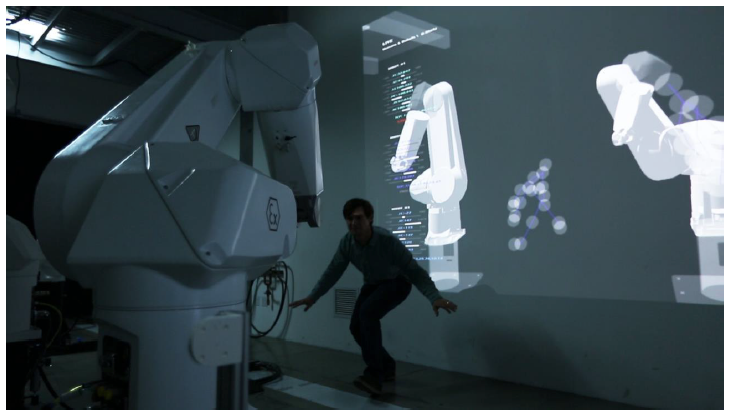 40 years after the first industrial robot was used, new robots such as the KUKA LBR iiwa (intelligent industrial work assistant) utilize force torque sensing on all seven axis, allowing information to truly pass in both directions, as the human can tell the robot what it needs to do, but the robot can also feedback what it is doing. Duration: 3 hour course, Mon 14th March 2016 10am-5pm. Description: This workshop will demonstrate the creation of physical object from a virtual 3D (CAD) model using PowerMILL Robot software. Typical applications include large format architecture, movie props and sets (Weta Workshop), Marine (Southern Spars), and any industry requiring a flexible large format manufacturing facility. 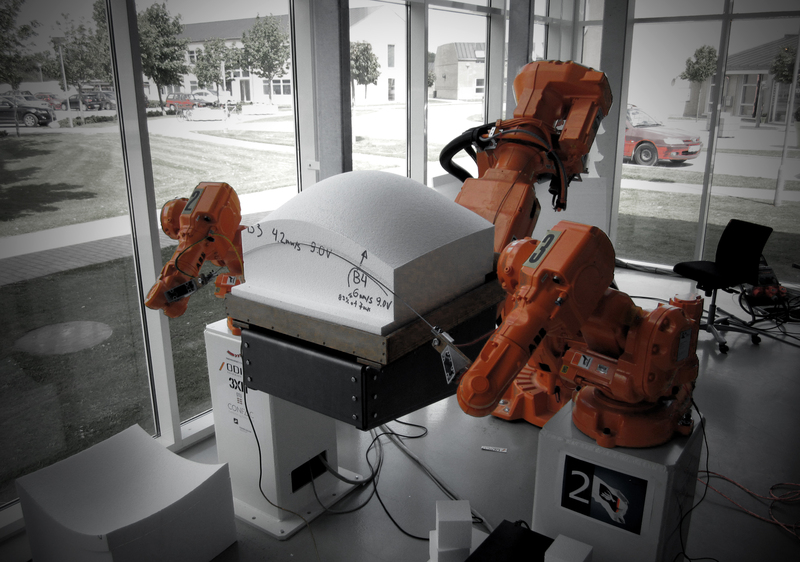 The result of the path planning will be the automatic creation of native KUKA robot language, which has been fully simulated and collision protected. Duration: Mon 14th March 2016 10am-5pm. Participants to bring: Laptop with CAD program. Description: This course will introduce the basis concepts and features of Grasshopper, a parametric Rhino plugin. Explore and become familiar with the Grasshopper interface and learn a variety of techniques and tools for 2D and 3D parametric design. This course is aimed at beginners in Grasshopper. The skills from this course can act as a precursor for further exploration of Grasshopper with plugins such as KUKA|PRC. Duration: 1 Day, Sun 13th March 2016 2-5pm. Participants to bring: No required materials.